I know there are many people that love nothing more than to escape at Christmas time and a cruise is becoming more and more popular as a Christmas holiday option, but believe it or not, I’m not sure if it is something I would want to do myself. As much as I love to cruise, if I was embarking on a voyage over Christmas it would HAVE to be sailing to somewhere cold and where snow is virtually a guarantee. I can’t do sunshine and warmth at Christmas time, I suppose I’m a bit like Kevin out of the movie Home Alone 2. When his parents say they are going to celebrate Christmas in Miami, he is pretty disappointed and I would be exactly the same. Another must about Christmas is a traditional tree, if there is no tree, or at least no green tree, then it’s not the same. I remember being on a cruise a few years ago and I disembarked on December 15th. I had been desperate to see the Christmas tree and I had prayed that during the night the crew would have erected this magnificent tree in the atrium and I could leave with a huge smile on my face. I didn’t exactly get what I wanted, but I did get to see the tree – in pieces in the back of a delivery van. That pained me, however, the following year luck was on my side. I boarded the same ship mid-December and the Christmas tree was already up! It was beautiful! I just stood looking at it (I love Christmas trees) and everywhere I went, I found another one! Albeit smaller than the one in the atrium, but it was still a tree. I guess the saying “good things come to those who wait” rang true for me that cruise. It was nice to hear Christmas songs playing onboard, too. Although I did leave on a cruise once on January 2nd and they were still playing Christmas songs on the in-cabin radio until January 29th – that became somewhat annoying! So, back to the actual cruising bit. There are so many people that book exotic cruises at this time of the year and I can understand why, but it just isn’t for me. My brain can’t digest seeing people on a Caribbean beach on Christmas Eve and wearing a Santa hat. Maybe one day I will change my mind, but if I booked a cruise over Christmas then I would have to be going somewhere that required thermals and snow boots. If I had to pick an actual region, I think I would go with the Baltic. I love the Baltic countries and the traditions of these very close, yet very different countries must be wonderful. I really do think it would be something rather magical and I would say the chances of snow were upwards of 85%. Absolutely perfect. I would also have to make sure that said Christmas cruise visited Germany, not for anything festive related, just so I could eat my own bodyweight in Currywurst – I love that stuff. 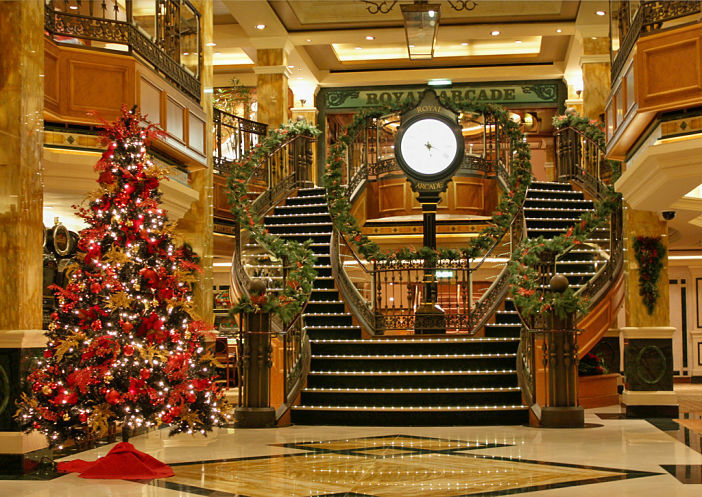 One thing I would definitely do on my Christmas cruise is decorate my cabin. I’d have a little tree, some tinsel around the mirror and maybe a “Santa stop here” sign on the door, just for fun. I would say the possibilities for festive decorating fun are endless, but let’s be honest, there’s only so much you can do with an inside cabin. If you were going to go on a Christmas cruise, where would you want to go? Image sourced via Flickr Creative Commons. Credit: Tanya Hart.